AVC is getting close, and it's time to check out the course revisions for this year. Have you ever wanted to spend six months toiling over a workbench creating a robotic masterpiece only to see it explode in a ball of flames five seconds after you turn it on the day of the race? We've got the perfect competition for you: the SparkFun AVC! 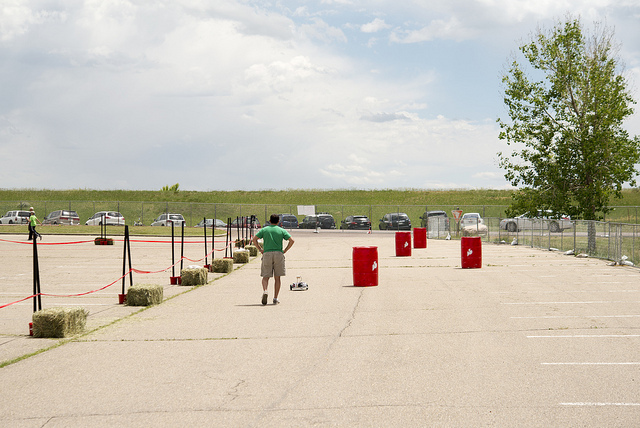 The Autonomous Vehicle Competition lets you put your autonomous vehicle through the paces with a separate ground and aerial course. The competition happens June 21st at the Boulder Reservoir. Check out the AVC site to learn more. We returned to the battlefield this week to shoot a short video detailing the course changes for this year. As we've mentioned in previous AVC posts, the course will remain pretty much the same as it did last year, with a few minor tweaks. For ground, we're adding a line (for line followers) to make it easier to enter the Micro/PBR class, which has size and cost restrictions. For the aerial entrants, we're adding three red balloons of death that can be either obstacles or an opportunity for more points. For the full rundown of the rules, click here. Also, it might be a good idea to re-watch the course preview video from last year. We've also added a bit more information regarding the obstacles you'll encounter. We now have the paint colors for all the obstacles, as well as a link so you can purchase your very own balloons for practicing. Be sure to check out all the information provided, including GPS waypoints. You have until May 21st to register, so head on over to the AVC site to register, read up on the rules, or check out videos or pictures from previous competitions. For anyone already registered, you have until May 21st to send us a "proof of concept." At the end of this month, we will send out a reminder with more details. Also, the AVC is free to come and watch. So bring the friends - we're covering the entrance fee for the reservoir for that day. See you then! New Tutorials To Get Your Learn On! maybe next year? I'd love to design the triathlon course :-) take off on a runway, fly to a way point, land, pass through a body of water, and then end on a land course. How many bonus points do we get for blowing up those barrels? T-minus one month until proof! Thanks for the preview. My aerial vehicle is under constuction and I'll be going for the balloons. Having the link to the balloons on amazon is a great help, it'll allow us competitors to tune the image recognition code ahead of the competition and it'll be important to get it very accurate because the balloons are really very small.